The Loch Leglean Tribunal is an administrative division of the Order of Hermes. It covers mainland Scotland, as well as the offshore islands ruled by the King of Man and the Isles. It does not cover the Isle of Man, under the terms of the Partitio Monaviae agreement. Its southern border (with the Stonehenge Tribunal) has yet to be exactly specified. This has led to significant differences of opinion among magi in the north of Britain. The original spread of the Order outwards from Durenmar was not without complications. In the early years of the ninth century, Damhan-Allaidh, a powerful wizard residing in what was then the Kingdom of Alba, led an orgnaised resistance to the Order of Hermes. Rather than face hermetic magi in magical combat, his followers cursed and harassed their followers, set traps and used mundane assassins to halt the progress of the Order. For a number of years these tactics were effective, and pessimistic magi claimed that the Order would be stopped at the English Channel. Tytalus the Founder entrusted Pralix, his most gifted apprentice, with the task of defeating Damhan-Allaidh. She brought as much cunning to the task as her opponent. Although her hermetic followers were slain or deserted her, she recruited scores of local hedge-wizards and in a series of devious raids and spectacular battles was able to defeat Damhan-Allaidh and bring many of his followers over to her side. Following her victory, Britain (or the Brittanic Tribunal, as the Order referred to it) was split into three portions. Hibernia in Ireland, Stonehenge in England and Loch Leglean to the north. Altogether, approximately 75 magi dwell in the covenants. In addition, there are another 25-30 magi who call no covenant home, but instead wander from place to place, or dwell as eremites, far from hermetic or mundane company. Following local tradition, Scottish magi refer to these itinerants as aonaronan ('wanderers'). The most prominent local magical tradition is the Damhadh Duidsan ('malice writers'). These highland magi are centred around Glen Geasadair, and number about twenty. By carving runes in a strange, dead language they call 'Ogham' into wood and stones, or by writing on their faces and arms in ash, chalk or blood, they wreak powerful Corpus magic. They are also known to be expert shapechangers, and to share the blood of the giants of Caithness and Sutherland. 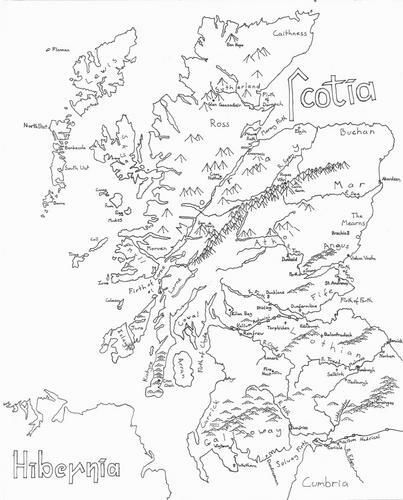 Meetings of the tribunal are held at Loch Leglean itself, in honour of Pralix's use of the site as a mustering point during the war with Damhan-Allaidh. In keeping with the fast-and-loose attitude of the local magi towards the Code of Hermes, and their close associations with mundane kin and neighbours, a great many mundanes attend Tribunal meetings, though they play no part in the debates or decisions of the magi. The Loch Leglean Tribunal, like its mundane counterpart, has always been fractious and prone to squabbles. The two issues that currently dominate its debates are the extent to which magi may interfere with mundanes, and the border with the Stonehenge Tribunal.